So many places to eat in Connecticut! No matter what you’ve got a taste for, restaurants in CT can dish it out. From top-rated dining destinations to roadside clam shacks. Local comfort food to cuisines from around the world. Unique culinary experiences, such as farm dinners, vineyards, brew pubs and even a Pizza Trail — you’ll find them all right here in Connecticut. 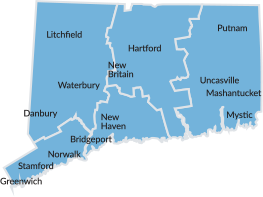 Whether you enjoy Chinese, Vietnamese, Japanese, Korean or Thai food, you’ll find a wealth of cultures and flavors in Connecticut. From fresh baked goodness to quick meals on the go, Connecticut is home to many bakeries and cafés that can make your morning or cater your event. Connecticut may be a northeastern state, but we bring the mouth-watering flavor of southern and Kansas City style BBQ home with these barbeque restaurants in CT.